Wanna to make picture collage for your numerous photos? Sometimes, you must be annoyed how to classify tons of digital photos in your camera or computer. Don’t worry; here I have a good idea – Make picture collage! Yes, just with a simple picture collage software, you can turn photos into magic digital collages. Collage Maker is the type of picture collage software exclusively designed to make picture collage easily. We like to capture the happy moments spent with our friends and family. And photos are one of the best ways to record exciting, joyful hours. Collage Maker allows you to display your photos in a special and unique way. Came with five collage templates, Grid, Classic, Free Style, Circular, Heart, Collage Maker provides an interesting way to blend photos into picture collage. Easy to import your photos, drag them to the best place. Use “Fill” button to quickly import photos to collage. Add a text to make a description for the photo collage or some information about the picture collage, like date, place and people that the pictures were captured. Enhance photos onto the photo collage by zooming, rotating, dragging. Fill collage background with color, photo, or stylish pattern. Save in your computer in image formats, such as TIFF, JPEG, PNG. Mail your creation to friends and family. Take a Print out and put it in your best memory photo album. Share it with your friends on Facebook and Flickr directly with the built-in function. 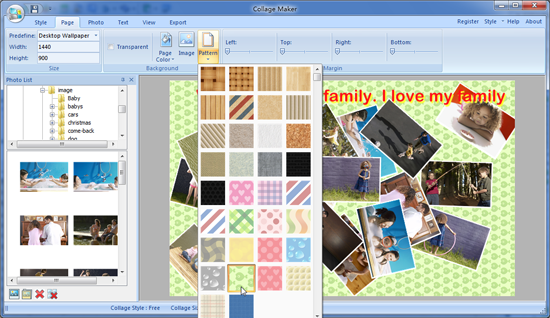 Evaluation version of Softease Collage Maker for Windows is available in the following link. There is also a Macintosh version which is available for download in the following link. for a limited time on Cyber Monday (November 26) Softease Collage Maker for Windows will be free to download for everyone. It will start on 00.00 Hrs PST and will stay for 24 hours. So,keep an eye on the giveaway page.